Shuang’s paper looks at the registration and initial lookup behaviors for malicious domains perform early identification of malicious domains (e.g., domains that are used to host scam sites). He developed these techniques in collaboration with Verisign, who have filed for a patent on the algorithms. 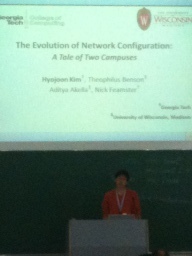 Joon’s paper looks at how campus network configuration has evolved over a five-year period, for two campus networks: Georgia Tech and the University of Wisconsin. He found that operators make tens of configuration changes daily, most of them for security-related purposes, such as access control.